We’ve said it before—we welcome only the best fit for our awesome axe throwing coaches. We look for characters who are strong-willed and enthusiastic. They have to be fearless, outgoing, and energetic, but most of all, unique. Meet Edmonton’s resident gamer and all-around muse—Jen Hauer. What location are you based out of? When did you join the Bad Axe Throwing team? What’s your favorite thing about working at Bad Axe Throwing? The fun times, the people, and the atmosphere. What’s your favorite memory/event from Bad Axe Throwing? I’ve had many, but one time a group brought in a cardboard cut-out of John Cena and we put him in the lane. Whoever hit him owed the rest of the group a round of drinks! When you’re not throwing axes, where can we find you? I play on multiple hockey teams—if I’m not at the rink I’m either playing video games at home or working at my other job (which is at an arcade). Hidden talent? I don’t really have a lot of hidden ones. I’m good at drawing cartoons, and I can play a bunch of instruments like the drums, clarinet, piano, etc. Tell us something weird about you that no one really knows. A lot of people don’t know I’m from the country, so I have a bunch of farm stories. When I’m having a conversation with someone I would start talking about when I was a teen “sorting cows and driving tractors back when I was 12.” I always catch them off-guard completely! Drawing, video games, music, and sports. I’m planning on going to school in Berlin in the foreseeable future. Can you do any trick shots? I can do many trick shots! One handed, two handed, double axes, underhand, backwards, sideways, side shot, behind my back, pistol… I’ve been practicing over-the-shoulder, but I’m not quite there yet! There you have her—Edmonton’s resident badass girl Jen Hauer. 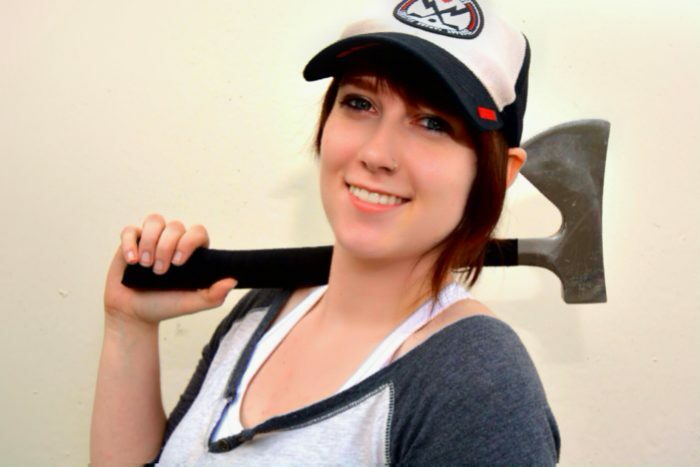 Get to know more of our expert axe throwing coaches on our blog at Bad Axe Throwing! Want to try axe throwing in Edmonton? Book with us today – spots fill quickly!